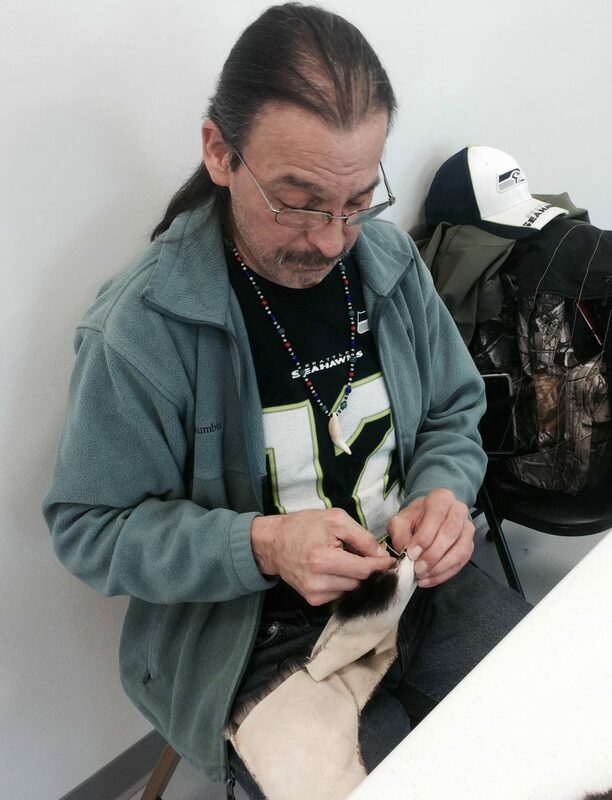 Arthur Larsen sews an otter-skin hat at Wrangell’s carving facility Sunday, March 1, 2015. Wrangell’s new carving facility hosted its first Alaska Native craft class last weekend, and about 20 residents signed up to learn the basics of sewing otter skins. On a Sunday afternoon, the carving facility was full of people quietly working on their sewing projects. They were hand-sewing sea otter skins to make hats, mittens, headbands, pillows and capes. Arthur Larsen was sewing a bomber hat, which will have flaps to cover his ears. “It’s my first time in a class, and it’s a really good experience,” Larsen said. Larsen said he and his daughter, who was stitching together a purse, were learning to sew hides for the first time. The Larsens participated in the first class held at the carving facility, which was completed in the fall. The Wrangell Cooperative Association wants the facility to help local residents become master crafters. For this class, Sealaska Heritage Institute (SHI) brought Yakutat-based artist Jeremiah James to Wrangell. SHI provided otter skins that were bought from hunters throughout Southeast Alaska. Coastal residents who are at least one-fourth Alaska Native are allowed to hunt otters, and they can only sell pelts to non-Natives if the hides are significantly altered. James said he was in Wrangell last year to teach hide sewing, but the class was in a smaller room. The new carving facility enabled James to teach a 19-person class. “It’s a great, great facility. It’s well-lighted, which is key for what we’re doing and key for carving,” James said. Class participant Arthur Larsen says more classes are planned. “There’ll be red cedar bark weaving classes, hopefully, coming down in the future. We have this beautiful carving facility, and it’s finished, and we’re just happy to be here and using this facility because that’s what it’s for,” Larsen said. Building the carving facility was the second step in the Wrangell Cooperative Association’s three-phase plan for cultural development. The first was the restoration of the Chief Shakes Tribal House, and the next is the recarving of eight totem poles. That will take place inside the carving facility. The WCA is planning a celebration for the carving facility later this year.